The sweet aisle can be an absolute nightmare for vegans, with even the top brands of sugary goodness using hidden animal-based ingredients that are often overlooked! In fact, one of our favourites has caused some controversy in the past. We’re all familiar with the sensational mouth-watering fruity goodness of Skittles. But the question resides, are vegans allowed to ‘taste the rainbow’? Yes, technically. There’s more to the story though, so read on below if you’re interested to find out more. Originally, in previous recipes, Skittles were a no-go for vegans. The ingredients consisted of animal-based products such as gelatin. Gelatin is made by boiling the bones, cartilage, and skin of animals — most often cows, pigs, or fish. However, this product was removed in 2009 and is no longer listed as an active ingredients of Skittles. Skittles also used to contain E120, often overlooked as a food colouring but it does in fact contain the red dye extracted from crushed female cochineal insects. This ingredient was removed in 2015. So what’s in skittles exactly? 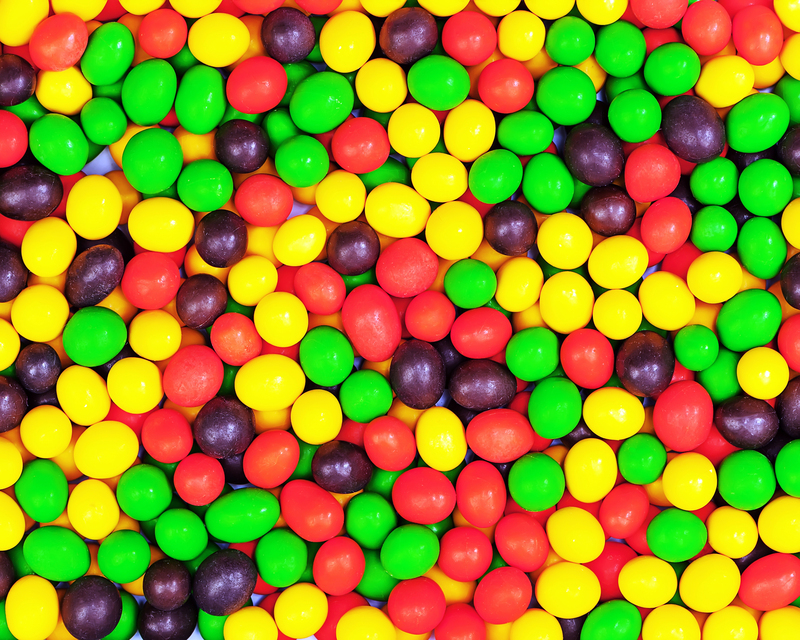 According to Wrigleys, the producer of Skittles, Skittles now consist of the following ingredients: Sugar, Corn Syrup, Hydrogenated Palm Kernel Oil, less than 2% of: Citric Acid, Tapioca Dextrin, Modified Corn Starch, Natural and Artificial Flavor, Colors (Red 40 Lake, Titanium Dioxide, Red 40, Yellow 5 Lake, Yellow 5, Yellow 6 Lake, Yellow 6, Blue 2 Lake, Blue 1, Blue 1 Lake), Sodium Citrate, Carnauba Wax. As you can see, Skittles don’t contain any animal products and many people argue that, technically, this constitutes them as vegan-friendly. It is important to keep a check on this though since producers often change up their products from time to time without any warning. One thing to be aware of is that even though skittles don’t contain any animal products, some ingredients have been said to directly harm animal habitats around the world. The main offender being Palm Kernel Oil. This ingredient does not originate from animals, however, in order to produce palm kernel oil, rainforests are cut down and destroyed. In fact, palm oil is one of the biggest causes of deforestation around the world. Should I avoid palm oil? Whilst palm oil does not originate from animals, it can be said to directly lead to the death of animals which dwell in rain-forests. A prime example being orangutans which are being mercilessly wiped out and driven from their habitat on a daily basis. As such, we do suggest avoiding it wherever possible. It’s worth noting however that avoiding every product that results in deforestation is going to be tricky. It will inevitably put a strain on you and your diet, and you need to decide if this is something you can accommodate on an ongoing basis. Some of us will undoubtedly put our ethics above the ongoing inconvenience, while others may feel avoiding animal produce is enough. If you are leaning towards the side of consuming palm oil, we would only advise making an informed decision. Maybe put some time aside to google the plight of orangutans so that you know the finer details of the situation.